My father is on about every Facebook hunting page/group that exists and ran across this yesterday. He contacted the person that posted it and received permission to use the pictures and information for the bowhunting education classes that we teach. Since we use my site and much of the information on here as a reference during classes I am posting the information here as a quick reference. From the story told, this lady’s poor husband was stepping on a rock when he slipped and fell down a 6 foot rock ledge. His arrows came out of his quiver and he was impaled in the hand and the leg. The one in the hand was the worst from what I am gathering at this point. 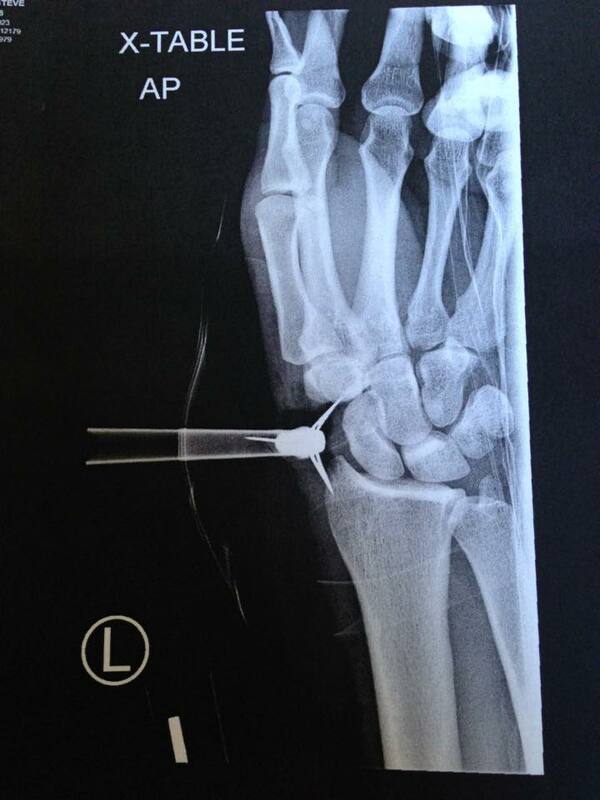 Here are a few pictures of the xrays. According to his wife, he had to walk out of the woods about a mile and half for her to come pick him up. He did try to pull it out, but luckily it did not dislodge. If it had, he would have probably bled to death. It cut the main vein that goes to the hand. NEVER pull out an impaled object. Stabilize it and transport the person/yourself as is. Many times your body will contract or close around these type objects so when you pull them out there is a distinct possibility of causing more harm. This is what the poor wife had to see when she picked him up. He did quite a bit of damage to his hand. 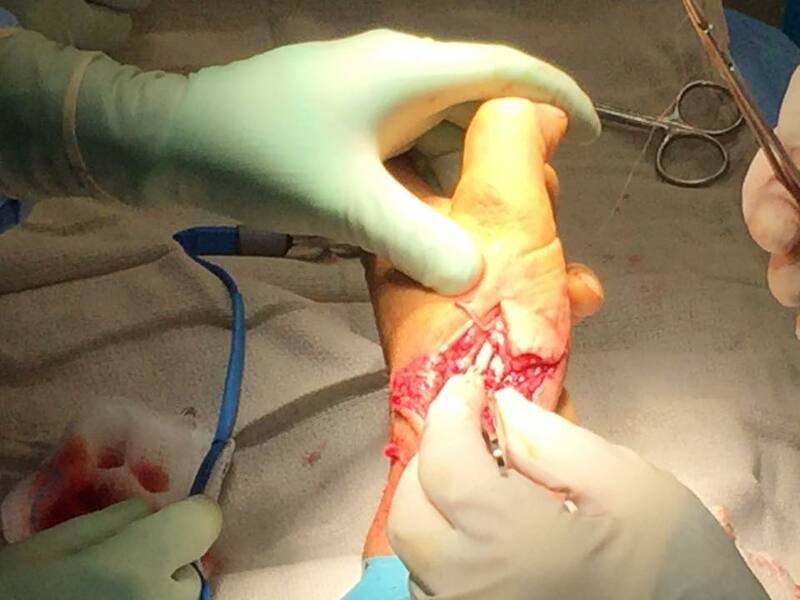 The main vein to his hand was cut, he severed 2 tendons, and got some nerves. As you can see from the xrays, he got pretty lucky. The radial artery is right in that area. You can see it a bit better from these pictures at the hospital. 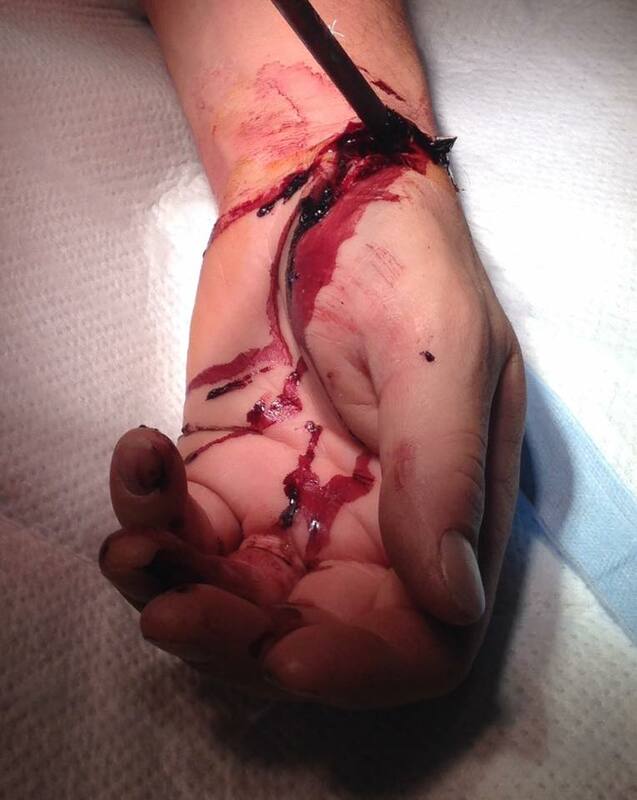 This guy is really lucky that he didn’t do more damage, cut his radial artery, or have to walk out further than he did. Even luckier for him is that his wife has a good sense of humor about the whole thing. She was joking and poking fun at the situation a bit in her post. Although situations like this are tough and take a while for the wounds to heal there is usually a silver lining to some degree. 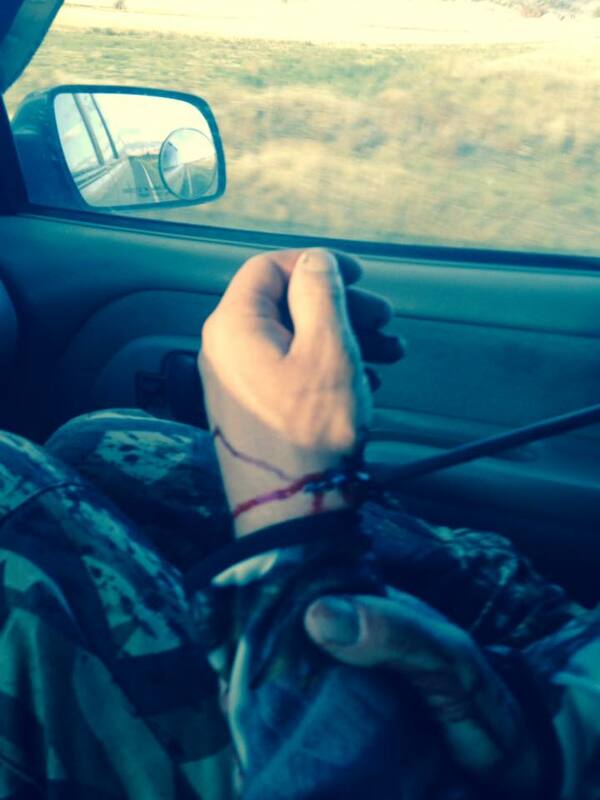 This guy’s wife allowed us to use this story and pictures to teach others how dangerous hunting can be with improperly fitting equipment. His arrows FELL out of his quiver when he slipped and bounced down the rock embankment. Most people skimp and try to save money on their quivers. This shows how saving money on a quiver really doesn’t save much in the long run. 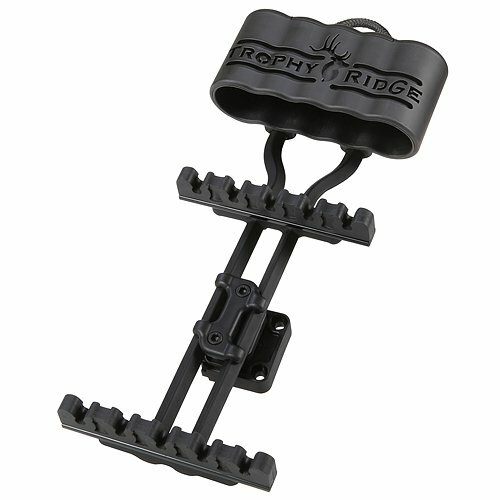 Make sure you have a quiver with at least 2 arrow grippers like the Trophy Ridge Lite-1. I only show you this one because I use it and I couldn’t think of another one offhand that has 2 grippers. 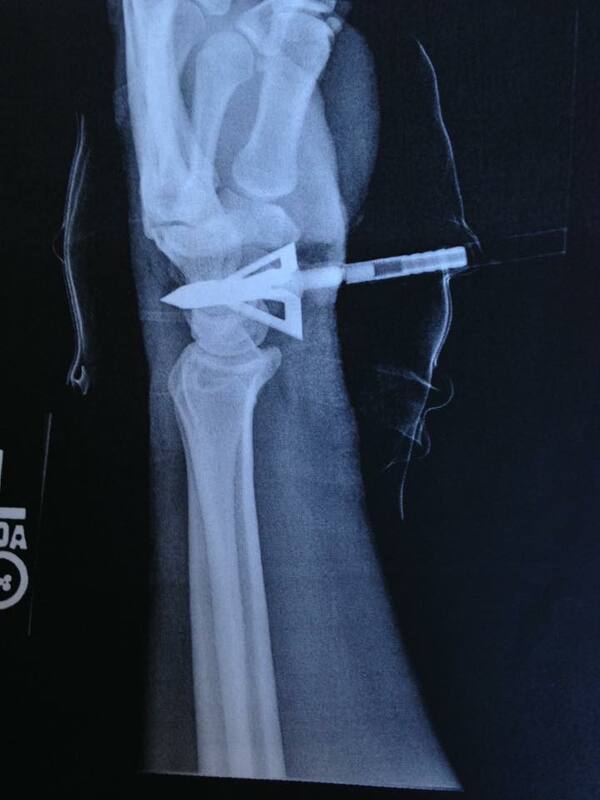 And for those of you who were paying attention to the xrays, the broadheads he had were Muzzy. Stay safe out there and keep your gear in good repair. No one wants you to end up tagging yourself instead of that Royal you were stalking for 8 hours. This entry was posted in Classes/Education and tagged arrow accident, hunting, safety on October 5, 2016 by Woodsbum.